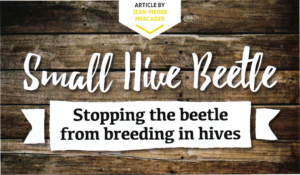 It was interesting to read about Dr Diana Leemon’s research to develop an external trap for Small Hive Beetle (SBH) (The ABK, August 2017, p. 42), and her goal that it will attract SHB is a step in the right direction – by moving away from putting chemicals inside the hive, and creating a device that will allow beekeepers to monitor beetle numbers before (and during) placement of hives. However, all the ‘traps’ and hive modifications available to date focus on controlling the SHB by reducing its numbers in the hive. No method focuses on changing the environment within the hive in such a way as to allow the bees to carry on their business uninterrupted, but at the same time make it a less attractive place for the SHB to reproduce. If the SHB are discouraged from breeding in the hive environment, they will be less likely to linger, and thus less likely to cause damage. Research to date has not addressed the major ‘essential reasons’ as to why the SHB are attracted to the honey bee hives to feed, but more importantly, to breed. This is the line of thought I have tried to follow in developing the Bluebees bottom board, and I outline my thoughts below. As a native French speaker, and one for whom English is a second language, I thank you in advance (the Editor) for converting my notes into presentable and readable English! 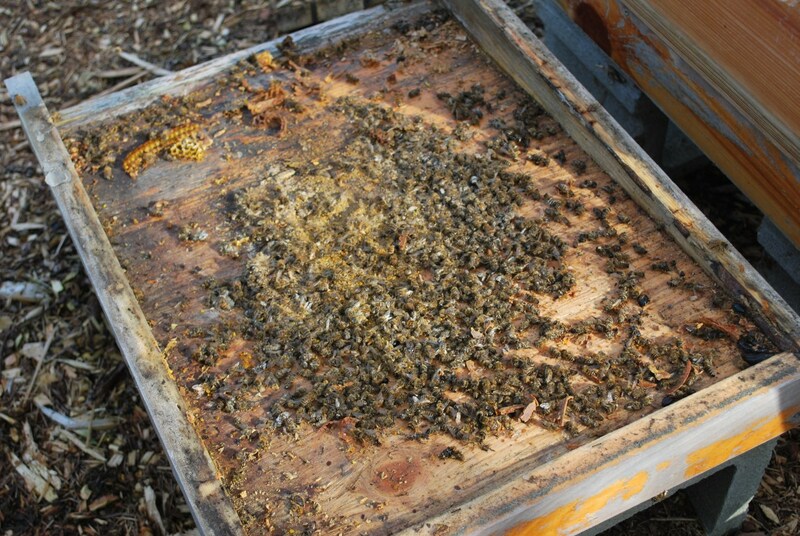 Plain bottom board, showing the dirt, debris and detritus it collects over time by a busy hive. 1. Remove areas (especially dark ones) where the beetle could hide from the bees. This would mean replacing the plain and mesh boards and other wooden sliced boards, thus removing any crevices that exist inside the hive. 2. Provide ventilation within the hive, especially at the base, which would discourage the beetles. At the same time, the ventilation could not be allowed to interfere with the reproductive activities of the bees themselves. Traps that had been developed with slots for beetles to drop through, into either vegetable oil or diatomaceous earth, seemed to work well, and the bees kept reproducing in such an environment. Why not go a step further, and have bases that had slots or gaps but nothing underneath, and which allowed the beetles to fly away to a more hospitable environment for them. 3. Provide some means by which the beetles could exit the base. This (and Point 2) led me to consider a slatted base, with gaps running in the same direction as the frames. 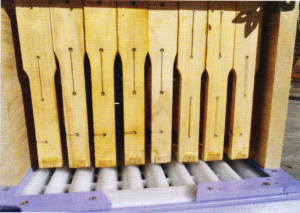 By positioning the gaps directly beneath the frames in the hive, and the same number of gaps as per either 8 frame or 10 frame hives, whereby the gaps between the honey frame is vertically right above the gaps between the corrugations, the beetles would drop through the gaps when they were dislodged by the bees. The wax caps of the bee cells would also drop directly through when a new baby bee pushes out of the cell. With a base that was open, there would be no areas for hive detritus to accumulate. The result of designing a board to satisfy the objectives. 4. Lower the humidity inside the hive. The SHB does not breed in areas of low humidity. Any water condensation together with any rubbish would drop between the gaps. This would allow optimum ventilation with dry hives, which would have the added benefit of being effective against Chalkbrood. 5. If the ‘solid bits’ between the gaps would be shaped so as to also make it more difficult for the beetle to stay inside the hive, and be more likely to fall through, so much the better. This led me to consider making these ‘solid bits’ from a slippery plastic and with an ‘upside down’ shape (corrugated). If the height and smoothness of the corrugations was right and the width of the gaps between the corrugations was the right size, the bees could keep working, the beetles would be ‘encouraged’ to leave, and the beekeeper would be happy. 6. Making the bases a whitish/blueish colour with a good degree of transparency allows natural light to filter into the hive, thereby further upsetting the pests (SBH and other pests are fundamentally dark in colour (brown, violet, black, dark green, amongst others), allowing them to blend and hide in dark areas such as corners, and escape from constant hunting by the bees). If it’s easier for the bees to detect the beetles, this is less time wasted when they could use the time to produce honey. Mesh bottom board, showing the dirt, debris and detritus it also collects over time. In order to achieve all of the criteria, I have developed the Bluebees bottom board. I have also found that the bees do not construct drone cells on the Bluebees boards because of the board design. 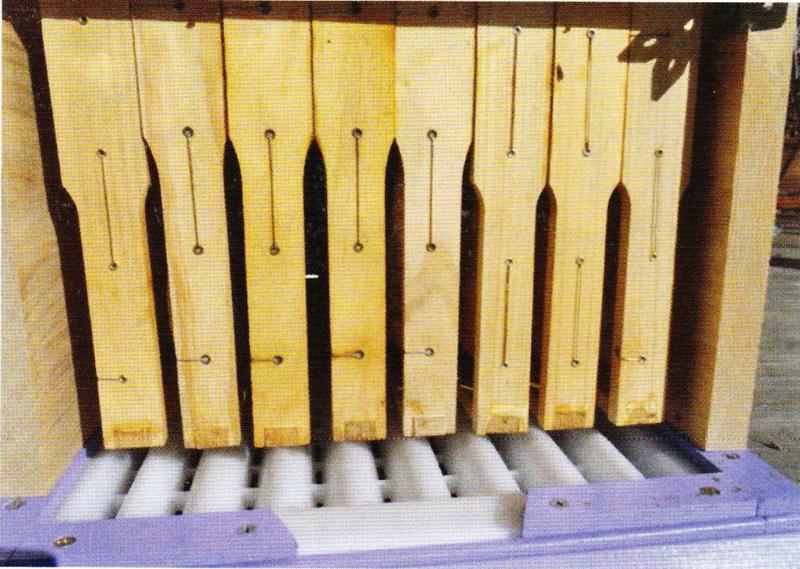 On both traditional and mesh boards, when the drones’ cells are empty, the pests such as the SBH, the wax-moths and others will hide inside, breed and make their new ideal home, again simply hiding from the bees. I have also had a substantial number of beekeepers who have reported to me that Chalkbrood became manageable and even disappeared when the Bluebees boards were installed. With the hive being drier, Chalkbrood (a fungal disease requiring humidity to survive) is kept under control by the bees. In terms of hygiene, the Bluebees boards are the best natural implement, and totally harmonious with the bee cleaning practices. Winter cold temperatures do not impact on the hive’s inside atmosphere at all. I have asked this question so many times, and none of the beekeepers questioned advised me that there were any concerns. However, invariably the feeding/availability of food during the winter is the major reason for a hive to die, not the cold as such, as long as the cold is dry. 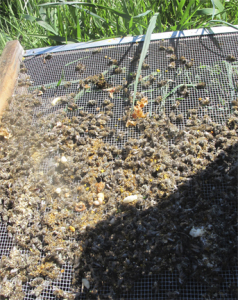 This has also been found to be the case with mesh bottoms, as seen in Dr Doug Somerville’s research, but mesh bottoms are often homemade and the mesh can be too small to effectively induce the beetles to leave the hive. 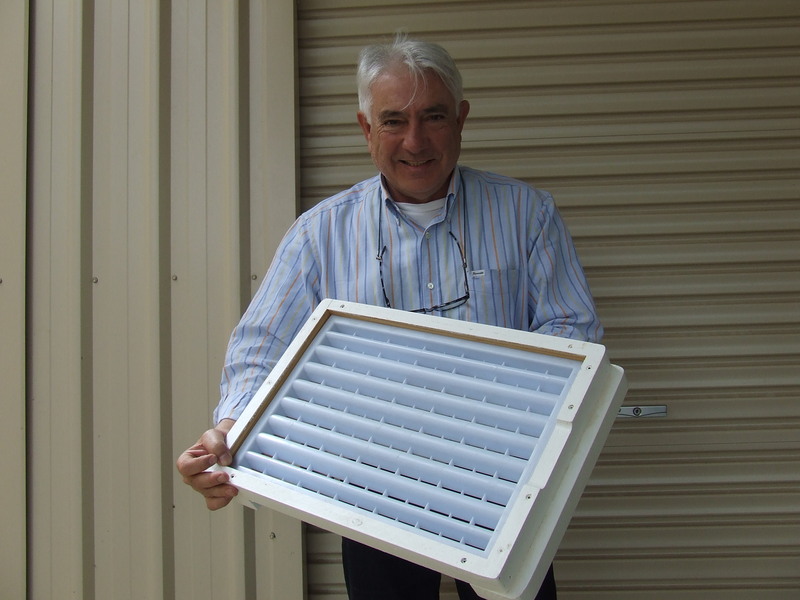 A poorly ventilated hive, cold and with high humidity, will result in the hive dying. Jean Pierre Mercader with his Bluebees Bottom Board, the only bottom board that assists the bees to self-clean the hive. In summer, the Bluebees board design provides excellent ventilation because the overall hive ventilation does not entirely rely on the entrance opening nor the two to four lid ventilation holes, in particular at night (the bee-beard at the entrance is no longer a concern). I do encourage beekeepers to keep their hives well above the ground to insure optimum ventilation. However, I have observed over the years that hives with the plain mesh/boards which are almost sitting on the ground will become more humid because of the transfer of humidity into the hive. The very survival and sustainability of the SHB requires food, a protective habitat, the right temperature, and the right humidity in order to breed and reproduce. Address the ‘raison d’etre’ inside the honey bee hives in terms of the ‘SHB sustainable breeding conditions’, then automatically it will control the SHB survival breeding abilities and conditions to which the SHB survival breeding abilities and conditions to which the SHB is fundamentally attracted to the honey bee hive. I have observed that the SHB happily breed in compost tips because the right temperature, right humidity and food are available. Stop the breeding conditions and you won’t have the SHB colonising the hive to breed. Sure, the hives with the Bluebees boards will be visited by the SHB because of the honey smell, but very quickly the SHB will fly away, with, of course, a little extra motivation from the bees. An assembled Bluebees bottom board. 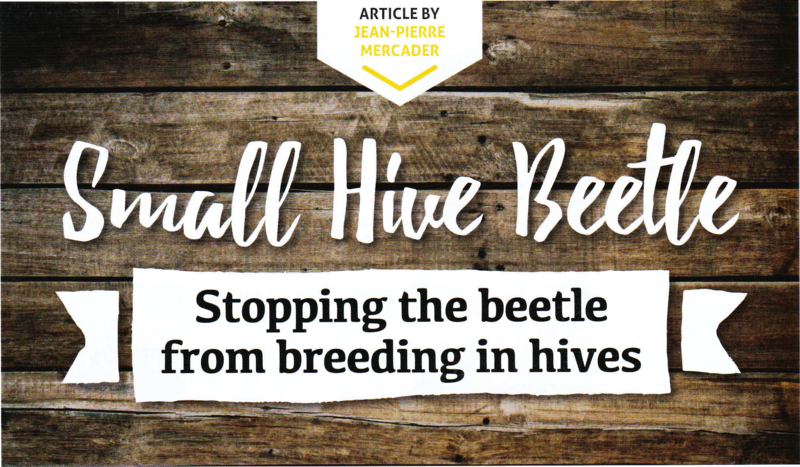 Article written by Jean Pierre Mercader, published in The Australasian Beekeeper, vol. 119, no. 5 November 2017.